This quilt “Under the Sea” was created by Karen Eckmeier of The Quilted Lizard Fiber Art Studio. 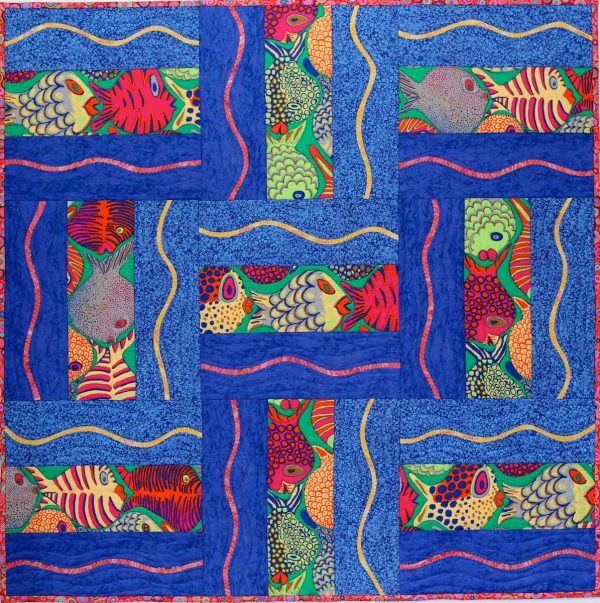 Perfect as a baby quilt, a wall-hanging or a lap quilt (36″ x 36″), this piece starts with a fun large scale print, bright colors, easy to piece rectangles and fused curvy waves. The BERNINA sewing machines have the perfect decorative stitches, like the crab and turtle, to complete the underwater theme. I’m known for making waves, in fabric that is. I wanted to try something different than my topstitched curves (aka Layered Waves), so I fused the wavy lines to add movement. This was a great excuse to get acquainted with the decorative stitches on my BERNINA 770 QE and to relax and enjoy the BERNINA Stitch Regulator (BSR) to quilt around the large fish patterns. I created this video with some helpful hints on drawing quarter inch wavy strips freehand. It really is fun making waves! 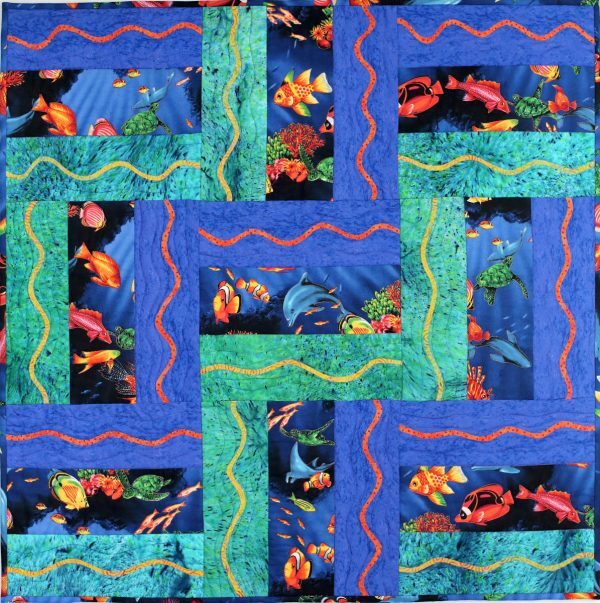 I also share some tips on how to incorporate the two adorable “sea-themed” decorative stitches to appliqué those beautiful wavy lines. In the video Karen keeps an eye on the screen to see when the motif is finished stitching in order to begin the next stitch as close as possible to the preceding motif. NOTE: A wonderful option is to use the Pattern End function on the BERNINA. It is located on the head frame, to the right of the Needle Stop Up/Down button. It looks like a tall triangle with dots next to it, which stands for “stop at the end when the motif has stitched.” As soon as you select the motif, press that button to activate the function. A light will appear around the button and a little stop sign symbol will appear on the screen at the end of the motif. 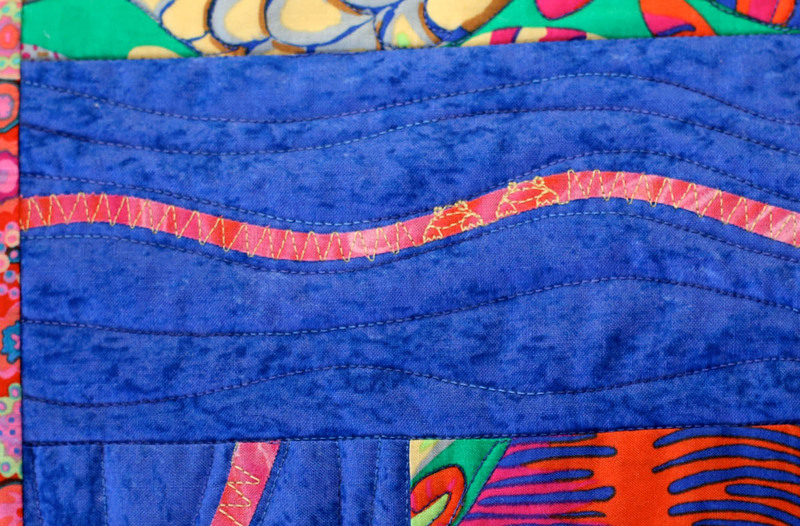 When the last stitch of a single pattern motif is reached, the machine will stop. Try both approaches and see what works best for you. 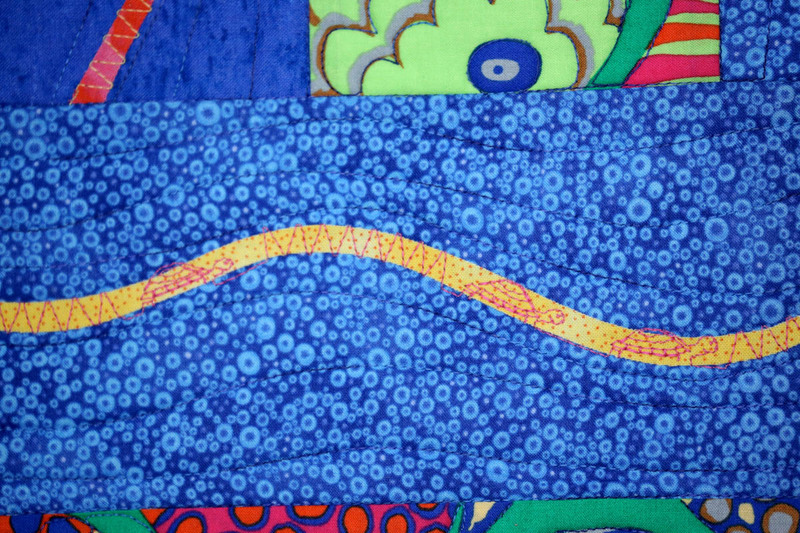 Are either of the fabrics of the bright fish still available and does anyone know the name for manufacture of them. Thanks so much. Yes, the large fish prints are still available. They are Kaffe Fasset prints. Aren’t they great?! Thanks for this tutorial Karen. I too thought that the tip with the two pencils is brilliant. Love the fabric, love the decorative stitches. The stacked plastic storage bins also caught my attention. Can you tell me who makes them and where you purchased them? Thanks a bunch. The storage bins are made by “Closetmaid”. I bought mine many many years ago at Home Depot. They are great for storing fabric and keeping it out of the light and free from dust. Good luck, I hope they still are available.